Plaster, paint spheres, sawdust, tire wear, charred wood, and natural minerals are blended in this agglomerate particle. Paint overspray dominates this agglomerate. These particle blend in the ventilation system and are released into the ambient environment over an extended interval of time. Remodeling agglomerates are particle clusters that indicate remodeling activities. These particles may agglomerate during a cleaning activity or they may agglomerate in the HVAC system. Their characteristic property is that they consist of particles like plaster, paint spheres, glass fiber, sawdust, and other particles associated with the remodeling activity. These particles may be associated with health complaints. 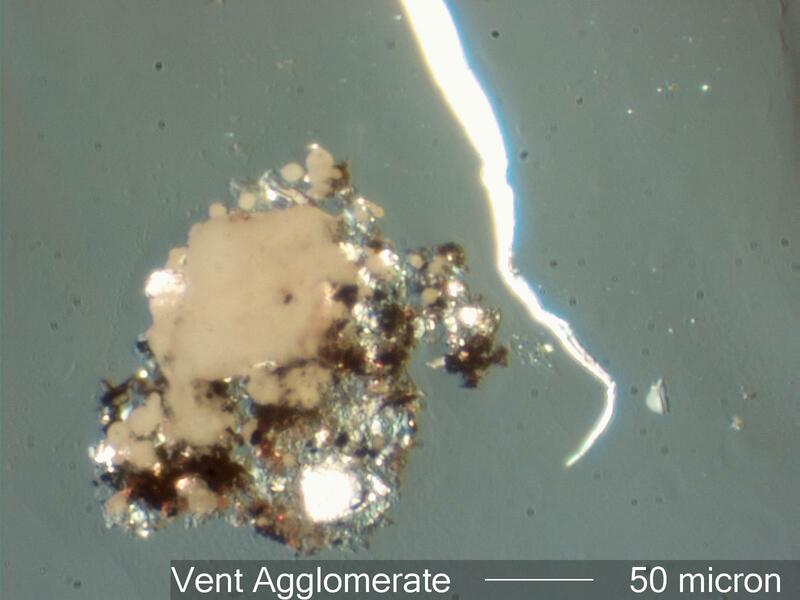 These particles indicate construction residues are part of the environment. Glass fiber, sawdust, and other agents in these particles may cause skin and upper respiratory system irritation.